Setsuko was born, named Setsuko Ideta, in Tokyo. In 1961 she graduated from Tokyo Morimura Gakuen High School in 1961 and entered the department of French language at Sophia University in Tokyo. As a university student, she met the painter Balthus who was visiting Japan for the first time in 1962. They got married in 1967. Setsuko assisted Balthus, acting as the headmistress of Villa de Medicis, where he presided as director of the French Academy in Rome. In 1973 she gave birth to a daughter, named Harumi. In 1977 Setsuko and Balthus left the French Academy and moved to Le Grand Chalet in Rossiniere, Switzerland. 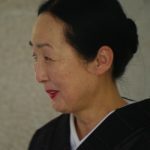 In 2002, Balthus Foundation was established, and Setsuko was designated as its honorary president.